Magnitude +13.5 minor Planet (626) Notburga approached the magnitude +12.4 star UCAC4-697-034339 from the south west. Field is 6' x 5' with North up. The star was occulted for a duration of 2.15 seconds, from 00:20:56.16 to 00:20:58.31 UT on 09 September 2017. Cloud started to obscure the field while the drift scan exposure for the last frame was being taken, completely blanking out the end of the trail of the occulted star. 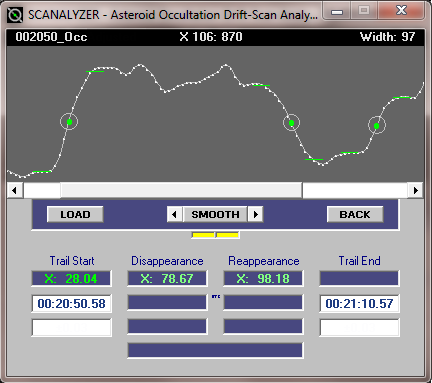 However, the occultation is visible in the first half of the trail and timings made by careful measurement of the start of trail, disappearance and reappearance, together with measurements of the star trails from all three exposures to determine the effective length of trail. Only the start of trail, disappearance and reappearance are shown. The end of trail was obscured by clouds. 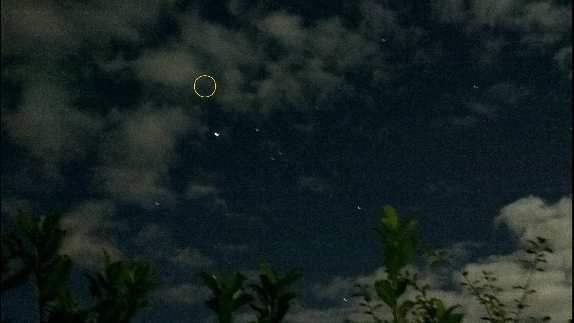 This handheld camera-phone image was taken while the end of the drift scan exposure was still in progress, showing the occultation field circled just northwest of Capella, with Auriga rising above moonlit shrubs. The 91% sunlit Moon was 65° distant.